This is the very first tick either myself or one of my animals has acquired in Southern Victoria – even though I hunted with hounds here for over thirty years and have owned as many as a dozen and a half dogs at a time. I used to see tiny ticks infecting the ears of Bluetongue lizards probably causing the deafness which results in their suffering from so many road casualties. It is possible to tediously remove them – an operation the lizards do not appreciate – but I have long since given up on it: in no time they find some more anyway. Spot acquired this particular tick West of Yinnar yesterday (31/08/2015) when he was trying out his handsome new raincoat (http://www.theultralighthiker.com/tyvek-jack-russell-rain-coat-13-grams/). I can report I have discovered yet another reason for preferring methylated spirits as a hiking fuel. After dousing the parasite liberally with it (from a teaspoon), and waiting about a minute, it was easy to pull the dead tick out complete with its head (as you can see) leaving nothing to cause an infection or irritation. I used a fine pair of tweezers gripping it just above its head. Easier than pulling a tooth! 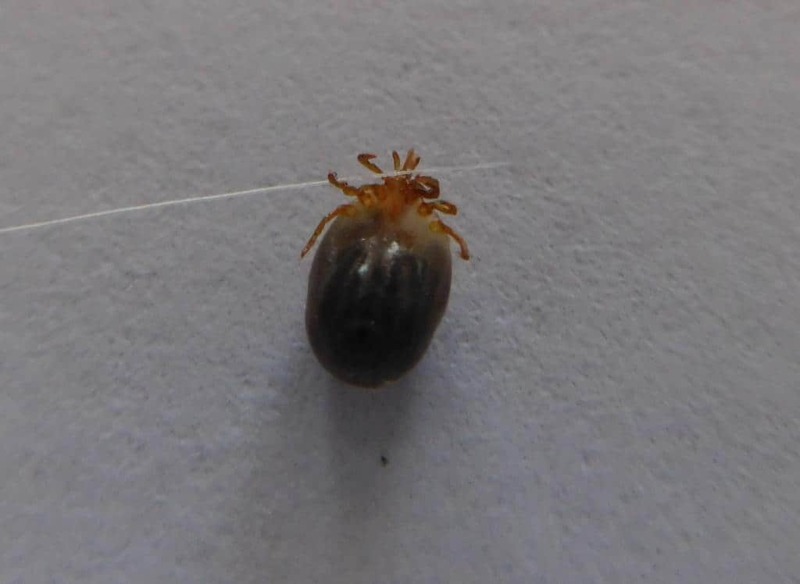 I have no idea whether it is a paralysis tick (probably not – but apparently they have been discovered this far South, so Watch Out!) You do have to be careful to check your pets for the blighters as they can cause death! A better alternative to metho is if you have some ‘mectin’ type insecticide about the house. Something with Permethrin in it preferably. You would use a small syringe or eye dropper to put 2=3 drops of neat insecticide directly on the tick. It will cause it to let go within a few seconds when you can easily remove it with tweezers without breaking off the head (which if left in the dog often causes a nasty infection and scarring). Wipe it off then wash the area down with water after you have removed the tick. In the US ticks have been implicated in the spread of Lyme Disease (a real nasty, previously mostly an occupational hazard to rat-catchers! ), so apart from the fact that they will create a very nasty itchy spot, and maybe an infection, it is important to get them out (particularly of yourself) as quickly and safely as possible. The meths is also a good antiseptic and fuel when hiking. Since i wrote this post, recently I have had two ticks on our oldest Jack Russell, Tiny (17!) which made her quite sick. The vet confirmed by microscopic examination that they were paralysis ticks – but they were acquired here in Southern Victoria, so be warned. A monthly treatment with eg Nexguard will keep them free of ticks, fleas and worms. This may be becoming essential pet care now. Yes, but I always have some meths with me in the bush, whereas I don’t always carry the Permethrin which I also recommend. At least it allows you to get them out whole. I once took a course in parasitology at university and can confirm that according to recent knowledge ticks should not be treated with any kind of chemical, fire, glue etc., because this puts them under stress and makes them inject even more saliva and/or intestine contents into the wound, i.e. more germs get into the body. Just extract them as quickly as possible without much manipulating and without squeezing their body. There are several appropriate tools available like tick hooks or tick tweezers. It doesn’t matter so much if a part of their mandibles breaks off and remains stuck in the wound, as it is usually pushed out after a few days (much like a splinter). Local use of a desinfectant after removing the tick may help, but the prime goal is to get the tick out fast. In Europe science is certain that germs are typically only transmitted after the tick has been sucking for several hours/days. Thank you Tim for your further information, and thank you for your compliment. I had two paralysis ticks removed recently from my dog by a veterinarian whose experience is profound. He used the Permethrin I spoke of. I will be taking the dog to him again soon for another matter. I will put your information to him to see what he suggests. I was mostly concerned about the effect on the dog of the paralysis tick, not about any diseases the tick might harbour. Here in Australia we do not yet have any serious tick-born infections such as Lyme disease that I know of. Cheers, Steve. Ah, I see. I did a bit of online research and it seems that with Australian ticks, like the paralysis tick, some experts recommend to kill/immobilise the tick with e.g. Permethrin before removing them. Thanks Tim, I had my dog’s appointment with the vet yesterday and he confirmed what you say. As many people carry alcohol stoves (or insecticide) I think it is worth trying to get the tick to dislodge rather than breaking it up. I know I scratched a grass tick off my stomach once when hiking in my early twenties (obviously leaving parts of it in my skin). I had an itchy spot there for over twenty years! Lyme disease (and no doubt others) in other parts of the world does pose an additional risk. I still think it is best to get the tick out whole (and as quickly as possible) if you can. My post was meant only as a guide to folks who had not encountered a tick before – most people in Australia probably – who would likely have zero idea what to do about it. If it is a paralysis tick for example, it can easily kill your dog. Cheers, Steve.